The WonderMill grain mill is now powered by a 1250 WATT LG motor that is superior in quality and power. 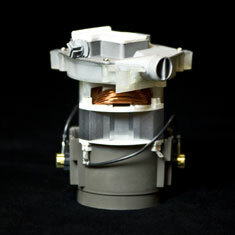 LG Electronics is known for their high quality, long l ife , and top of the line appliance motors. The motor they developed for the WonderMill is no exception. It is the most powerful micronizing grain mill motor on the market today and it is built with such quality that it will last and perform for as long as you own you're WonderMill, or even longer. Many grain mill motors are made by no-name companies that try to imitate the performance and durability of LG Electronics but fall far short in all specifications. With WonderMill, you have the assurance that the motor is made by one of the World's top quality motor companies, LG Electronics . Not only is the WonderMill the most powerful grain mill but, because of its extreme quality and craftsmanship, it has proven to be hands down the most durable motor also. Despite the fact it is only warranted for home use, many small commercial bakeries use the WonderMill under heavy continuous use, and milling over 100 pounds of grain a week, for several years without problems. Because of this quality LG motor we are able to back the Wonder Mill grain mill with a limited Lifetime Warranty. We are so confident in the quality of the LG motor that we decided to put our money where our mouth is by grinding a HALF TON (1000 pounds) of grain NON-STOP (for almost 10 hours straight). Not only did the WonderMill grind the half ton of wheat into beautiful bread flour with no problem but it's still going. That very mill is still in use today in our demo kitchen and is used for all our other tests and is still running as strong as the day we took it out of the box over 2 years ago (see video to the right). After we tested the WonderMill, we decided it was only fair to put our competitor's grain mills to this same test. The results told the real story, not one of the mills we tested even came close to the 1000 pounds of grain before burning up. When we say burning up we really mean it, they smoked, sparked and died. WE ISSUE A CHALLENGE to any competitor to put their grain mill though this same rigorous endurance test on video for the world to see. We don't believe there is a grain mill out there that can perform like the WonderMill. Like Grandma used to say "the proof is in the pudding"
Despite the lack of any real research some nutritionist's have claimed that most electric grain mills run too hot and kill nutrients while grinding. Let's face it you grind your flour and put it in a 350 degree oven for up to an hour, so this seems a little silly. But even if this argument is legitimate, this temperature problem is not a factor with the WonderMill. The WonderMill's 1250 WATT motor has enough power that it does not have to work as hard to do the same job, and this equals less heat produced. The latest WonderMill also has improved air flow to the motor allowing it to run cooler. With these great qualities, the WonderMill keeps flour temperatures at an average of about 115 degrees, assuring you that your grains will maintain their nutrient value through the milling process. Because the WonderMill LG motor is built with such high quality components and has such high power, combine this with the new free flowing design of the cyclo system, clogging and melt down issues that some grain mills experience are almost nonexistent with WonderMill. This equals more confidence in your grain mill and almost no warranty work for us, we both win. The new style WonderMill with it's LG motor is now so powerful that if the power turns off during the milling process, it can be turned back on and continue grinding as if nothing had interrupted the milling process (see video to the right). This eliminates some common worries like: "what if my power goes out while milling", "what if I need to answer the door or phone before its done milling", or "what if I want to fill the hopper before turning on the grain mill". WonderMill "Proven to be the Best Grain Mill"
The power and quality of the WonderMill's LG motor is just one more thing that supports the expert's claims as well as our claim that the WonderMill is the BEST MOST DURABLE GRAIN MILL on the market today. The WonderMill is simply more powerful, longer lasting, higher quality, and performs better than any other electric grain mill on the market. Just one more reason it is the World's Number one Rated grain mill.